I was curious to see exactly where Ian is right now. Maybe you are, too. As you can see, he is getting pretty close to the top. The team went through Lava Tower and Arrow Glacier today. They are spending the night at Barranco Camp. I might be wrong about this, because I don’t remember exactly how many days they are making their hike, but I would guess the following is the plan. Monday night (close to midnight Tuesday morning) start the hike to Uhuru Peak and reach it at sunrise. Get to the summit Uhuru on TUESDAY. They will spend a few minutes there, take pics, and head back down. 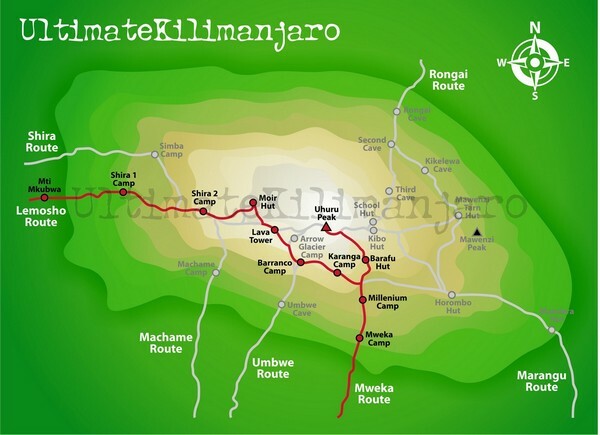 Complete the hike Wednesday or Thursday through Mweka Camp.